Sakai Akazawa’s Shiro-Ko Kasumi line sports a blade steel crafted out of White Steel (WS), a high-carbon steel that often possess an HRC ranging anywhere from 62-63. 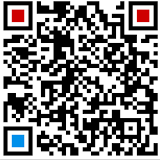 WS is a very popular blade steel. 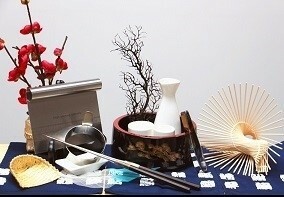 In fact, it is the most common type of blade steel found in traditional/Eastern kitchens. Chefs & cooks alike enjoy using it because in spite of its hardness it is relatively easy to sharpen and takes on a very fine and sharp edge that proves to be an invaluable resource in the kitchen. One downfall of WS is that it rusts when it comes into contact with air and water, and therefore needs to be dried thoroughly before being stored. “Kasumi” knives are similar to “Hongasumi” knives with the exception that “Hongasumi” knives have their soft-iron and high-carbon steels bonded together by a blacksmith, which usually leads to a purer finished product as a skilled and knowledgeable blacksmith can remove many of the impurities from the metal(s) that is being forged. 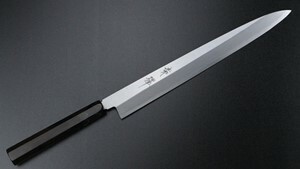 The blade steel of “Kasumi” knives on the other hand has its soft-iron and high-carbon steel pre-bonded by automated steel factories prior to being forged into a kitchen knife by a blacksmith. 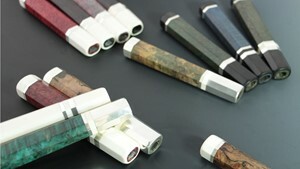 The Shiro-Ko Kasumi knives sport a traditional-style, octagonal handle embedded with a buffalo horn bolster for balance. 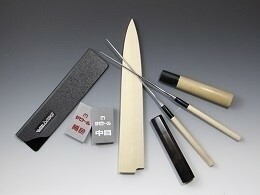 Recommendation: Sakai Akazawa’s Shiro-Ko Kasumi line is best suited for beginner cooks and chefs who are in the process of learning about the intricacies of kitchen knives but require a reliable and high-quality knife to work with. The knives in this series rust and must be dried off properly before being stored.